Is your hair fall problem making you tensed and conscious? Then it’s the right to think about Hair Transplant treatment. Hair Transplant can help you to grow hair naturally on your scalp. It is the most effective and valuable treatment nowadays. Having a Hair transplant can be a big decision for you, so firstly know the detailing about Hair Transplant treatment then go for it. If you are in the search of best Hair Transplant clinic in Delhi, Cosmotree Clinic is at your rescue providing you with the best Hair Transplant in Delhi/Gurgaon, and Mumbai so that you can have locks you always wanted. 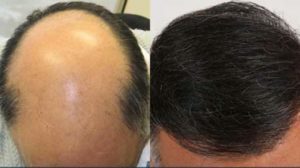 We have years of experience in Hair Transplant treatment in Delhi and Gurgaon for men and women. A hair transplant is a procedure in which a dermatologist moves hair to a bald area of the head. The surgeon usually rearranges hair from the back or side of the head to the front or top of the head. These hair treatment procedures typically occur in a medical office under local anesthesia. Hair transplantation is one of the quickest evolving procedures in aesthetic surgery. Cosmotree clinic offers one of the hair transplant in Delhi/Gurgaon, and Mumbai with our team of best and efficient doctors. At Cosmotree Clinic our specialist will examine your condition thoroughly and will offer you customized treatment according to your skin and body needs, skin sensitivity etc. 1) FUT: Follicular unit transplantation is a procedure where hair is transplanted from areas at the back and sides of the scalp, and moved to balding areas of the scalp. It is also known as strip method. The patient is anesthetized and a doctor removes strips of tissue from the area, and, once extracted, the strip is cut into individual follicular units. The doctor then makes little holes in the scalp, where the follicular unit grafts are carefully placed. • More affordable than other hair procedures like FUE. • Both methods have a very quick healing period and medication can be prescribed if needed. • Both techniques of hair transplantation are relatively simple. • You may also be advised to shampoo your hair twice a day after around 7 days of the surgery. • Take the medications prescribed for you by your doctor. • Cover your head with hats to avoid direct contact with UV rays. exercising after few days after the procedure. It usually takes 10 days to 14 days to recover from an FUT procedure. 2) FUE: Follicular Unit Extraction modern technique of hair transplantation. This treatment is more advanced than previous methods of hair transplantation, such as FUT. In FUE, the doctor extracts hair follicles from the area (typically the back of the neck) with the use of a specialized extraction instrument. The follicles are then transferred to the balding area. Using a specialist micro surgical needle, the surgeon will puncture the scalp area that will receive the grafts. The grafts are then inserted at an angle into the recipient area, and with a specific density, so that it will resemble a natural and realistic hair pattern. With no stitches required and no scar left to heal, FUE procedures do have a quick recovery time and less post-procedure discomfort compared to the traditional FUT procedure. Since the doctor must remove each hair follicle individually, the time-period of an FUE procedure usually, makes it more expensive than an FUT procedure. As stated earlier, FUE technology is improving as well as gaining popularity and many hair clinics have started to lower the cost per graft price for FUE procedures. Nowadays, the cost difference between a FUE and a FUT procedures is comparatively less. When having a FUT transplant a strip of tissue will be removed from the back of the head. Because of this, it can take much longer to heal with the initial healing process taking up to 10 days. As a strip of tissue is removed from the back of the head a FUT transplant can leave patients with a scar. • Patients worldwide favor FUE over the strip procedure as for most patient FUT is now outdated. tiny puncture scars that are almost invisible to the naked eye. If you’re seeking a solution to your hair fall concerns, a hair transplant treatment might be exactly what you’re looking for. But it’s important to choose the right dermatologist to ensure you get the best results. At Cosmotree Clinic, you’re in good hands. Our specialists will provide you with the hair transplant treatment to meet your cosmetic goals, and we’ll do our best to keep you comfortable every step of the way. Give us a call at 9999909292 to schedule a consultation today.